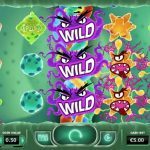 As much as we try to avoid viruses in our everyday life, well it seems that we cannot do that in the latest video slot game from Yggdrasil, Cyrus The Virus. Well, just to assure you, you are safe here in front of your laptop or mobile device. All those viruses are entrapped on the green looking reels and they will not come out. What we have to point out when it comes to Cyrus The Virus is that the pay lines work both ways. We have 10 pay lines in this game and 5 of them work both ways, which turns out to be very helpful with the wild feature. The wild symbol is the DNA strand and it appears on the center reel only. Every time it does, it will expand to cover the whole reel and it will turn into a grumpy looking DNA. And that is not all, you will receive one free spins with the wild remaining in place. This is where the both ways pay lines will do their trick. 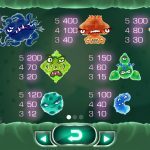 Cyrus The Virus is probably a game that all biology buffs will love. Probably Yggadrasil had those people in mind when they created the game. But all of us, regular people can enjoy the game as well. 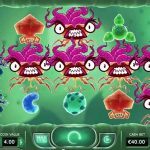 Do not be put off just because those small viruses are everywhere, since if you line them up in the right position they can bring lots of rewards your way. The concept of the game is very well thought, so it seems like you are playing a bonus round during your whole game session because the wild symbol appears very often. If you have not come across this game so far, we believe that you should give it a try now, since we had a very profitable session so we believe you will too. For another great engaging slot you should consider playing Chibeasties a 5 reel slot by Yggdrasil.